Are you kidding? This was my all-time FAVORITE movie when I was a kid! I loved it so much I swore I was going to name my own daughter after Savannah! Aww, that's so sad. I remember though. Thanks to HBO, I grew to despise Superman 3. It's a crappy movie but dang, every day, maybe twice, for a year? 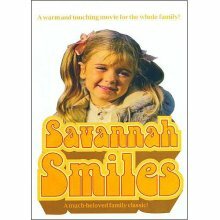 I watched Savannah Smiles over and over on HBO! As a kid, I loved how HBO repeated movies over and over. Love your blog btw! Of course I know this movie! Classis 80's flick. My sisters and I loved that movie and still quote it to this day. If I have a daughter, the name Savannah, thanks to this movie is most def. in the running for her name. Cute movie for sure and so very sad how she died. I looked up Bridgette and found out about her death awhile back when I was researching the actresses who appeared as the kids in Parent Trap II. Turns out the other girl in that film went on to become a lawyer and is now a writer. Sad that her co-star went down such a different path. I was obsessed with this film. Her adorableness was hard to resist. thx for the reminder! I LOVE this movie!! 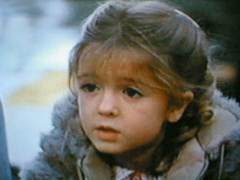 She was so cute!! Sad that she died though, I didn't know that. I did not know she died..
Really wish I could find it on dvd. One of my first email addresses was savannahsmiles ! This was my favorite movie as a kid!She was about my age and I thought she was so pretty. I ended up naming my daughter Savannah after this movie...she's 17 now. So sad how Bridgette ended up. I found out about it back around 1999 and couldn't believe it! I loved this movie! About a yeat ago I found the movie in a $5 dvd bin, grabbed it right up, and introduced my 6-year-old to this feel-good movie favorite. My daughter, now 7, watches it often and loves it! This is the best scene in the movie! I love the way she does her little gestures and that song at the end is so cute!! "I was born and raised in the briar patch, born and raised in the briar patch!! Dan, dan da dan!!" Savannah must have memorized all those TV shows she watched in her room while her parents ignored her. By the way, I love the Snoopy suitcase that she used to run away. It reminds me of my childhood and all the cool Snoopy items I had in the 80's. I absolutely loved this movie as a kid & like everyone else watched it over and over again on HBO. My oldest daughter is named after Bridgette's charater Savannah, my daughter is 15 now and she came out with the same hair color! Which is neat bc myself and husband are dark haired brunette, as are my other kids (all frm my husband) It saddened me that such a promising actress is gone. But she dose live on in the role she played as Savannah which still touches our lives.